I’m a big advocate of eating leafy green veggies with every meal to avail of their powerful cleansing and energising properties and their huge spectrum of vitamins, minerals and protective phytonutrients. 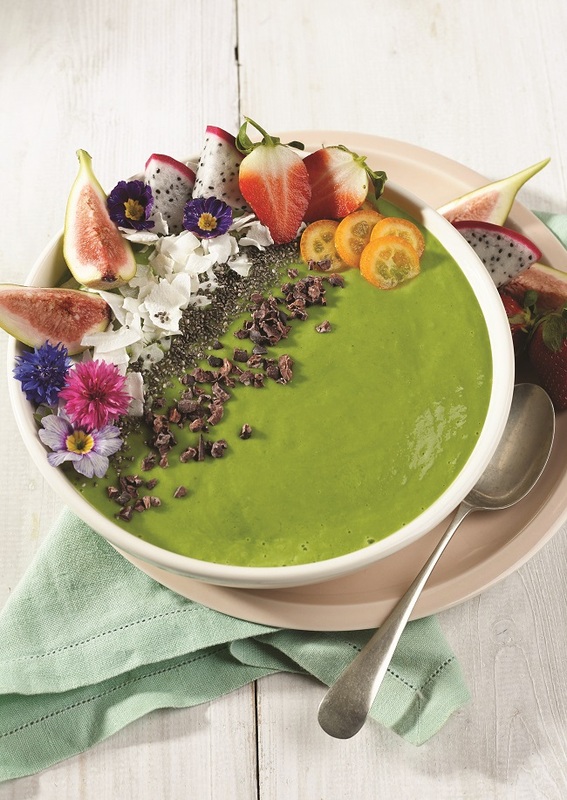 This supergreen smoothie bowl recipe is a great way to enjoy all the goodness of spinach, kale and avocado, sweetened with fruit to hide any ‘green’ taste. 1. Place all the smoothie bowl ingredients into a blender and blitz until smooth. 2. Pour into a bowl and top with coconut flakes, fresh berries, fresh figs, dragon fruit, chia seeds and cacao nibs. Any leftovers can be stored in an airtight container in the fridge for two or three days. Rosanna Davison is a model and nutritional therapist. She leapt to international prominence at the age of 19 when she was crowned Miss World 2003. In the years since earning that accolade, she has established herself as one of Ireland’s most recognisable media personalities. Her website, RosannaDavisonNutrition.com, has grown rapidly since its launch in March last year. Rosanna’s debut release, Eat Yourself Beautiful, was a No. 1 bestseller. Following on from the success of Eat Yourself Beautiful, Rosanna Dis back to help you get fighting fit, fast! With over 100 powerful recipes that complement and enhance your fitness routine, a sample diet, exercise plans and tricks to keep you motivated, Eat Yourself Fit has everything you need to look and feel your very best.